Johan Heyns has been at it again! 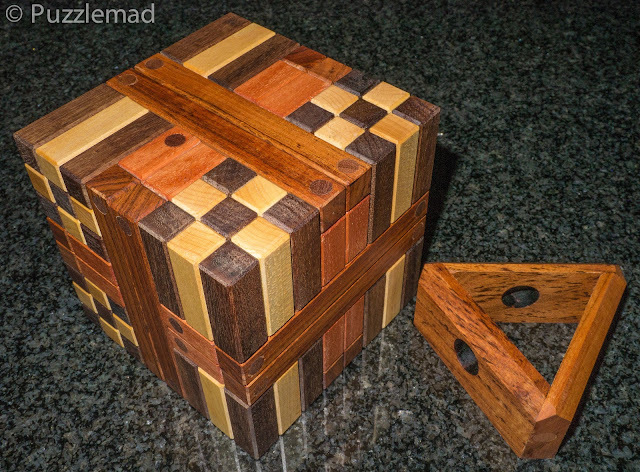 He put out on his Facebook page and by email, a notice that he wanted to make a few new puzzles for us addicts and, whilst I couldn't afford to buy them all, I had to order the Mouscub puzzle from him. It just arrived on Friday. The design is by Stephane Chomine and is a mixture of plate burrs and stick burrs with a level of 25.6.8.15.3.9.7.7.2 - OMG! Johan has made it from Mansonia and Maple (forming the sticks) and Rhodesian Teak and Saligna for the plates. There have been multiple reinforcing dowels used which I think add to the attractiveness. It is big and heavy and as usual, comes with its own specially designed stand. This may well beat me but it will look fantastic on display!